Mold and ragweed season is right around the corner, which means it’s time for fall allergies to kick into high gear for millions of Americans. And it’s not just the seasonal pollen and spores that are a concern; we’re constantly surrounded by potential food, drug and chemical allergens. 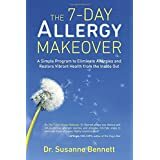 If you don’t want to resort to sleep-inducing antihistamines, what can you do to reduce your exposure and limit your body’s reaction to unwanted invaders? Read these books to find out. 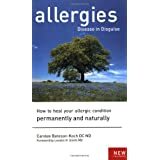 From food sensitivities to hay fever, these volumes cover a wide range of information about allergic reactions and root causes. Don’t suffer through your symptoms alone! After the cupboards are cleared of problem foods, most people coping with new food allergies (their own or their kids’) are missing staples they have relied on for years. And even though stores are stocking more allergen-free brands, shoppers with severe or multiple allergies can read every label and still strike out—especially if they’re after a particular craving or on a budget. The good news for the 15 million Americans with food allergies is that classic treats and pantry staples can be made easily and affordably at home. 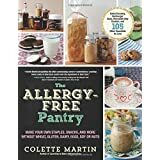 From Colette Martin, the author of Learning to Bake Allergen-Free, comes The Allergy-Free Pantry—with over 100 recipes free of gluten and the top eight allergens (milk, eggs, peanuts, tree nuts, soy, wheat, fish, and shellfish). Longing for a kinder, gentler world? As the old saying goes, everything begins at home, and odds are, if you live in the all-American household, the air inside is more toxic than the air outside, even if you live in the most polluted of cities. You regularly handle the filthiest object in your home—the kitchen sponge—and put the same chemicals on your face that are used in brake fluid and antifreeze. The cleaning agents and personal care products commonly marketed to and used in American homes contain not only some very dangerous, toxic chemicals, but they also create an "overly clean," chemically bombed-out house that compromises immune systems. And with more than fifty million Americans suffering from allergies and other autoimmune diseases—not to mention the developing and fragile immune systems of children and seniors—large numbers of people are actually being made sicker and sicker by their homes. 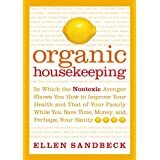 Learn to live a clean, healthy, more economical way with Ellen Sandbeck, the nontoxic avenger. 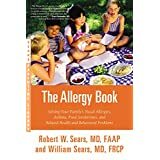 From America's most trusted name in pediatrics, a comprehensive guide to treating and preventing nasal allergies, asthma, food allergies and intolerances, and more. Allergies are one of the most common ailments, causing children to miss school and parents to miss work. Left untreated or unresolved, stuffy noses, itchy skin, and irritated bellies can lead to chronic asthma, eczema, inflammatory bowel disease, and neurological disorders. Today's parents don't just want to treat their family's allergy symptoms—they want to eliminate allergies and prevent chronic and long-term health complications. The Sears show them how. Pinpointing the root cause of allergies can be a trying process. Using a "food as medicine" philosophy, this solution-oriented, do-it-yourself cleanse program features a mostly raw and vegan eating plan centered around whole-foods and juices. 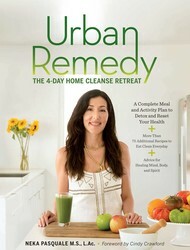 From the popular Urban Remedy founder, Neka Pasquale, this is an appealing, lifestyle-driven roadmap to whole-food cleansing, weight loss, and balanced health. 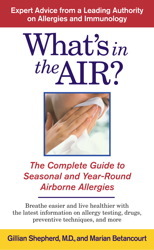 An up-to-the-minute look at what we know about airborne allergies—why they strike, how to avoid them, and how to handle the symptoms that do appear—with information on the newest, cutting-edge drugs that will be hitting the market just as the book appears. Manage your allergy symptoms year-round with expert advice from board-certified allergist and immunologist Dr. Gillian Shepherd. A step-by-step guide to understanding and coping with hay fever, perennial rhinitis, and other allergic reactions. 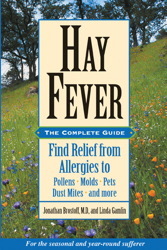 • Helps to determine whether you really suffer from hay fever and how to deal with it on a year-round basis. • Shows how to lessen your symptoms without drugs and how to avoid reactions in the first place. 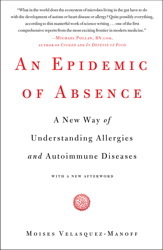 • Explains how to minimize the development of allergies in your children. • Includes appendices on pollen seasons around the world, air pollution, and useful products and resources. Almost everyone has thought that they may be suffering from hay fever at one time or another. But what is hay fever? And what are the most effective treatments? Hay Fever: The Complete Guide looks at these questions and provides the scientific background on the causes and types of hay fever and related sinus conditions and how to treat them for the most effective results. The authors explore all the issues of respiratory allergies, including the links between asthma and hay fever and the related issue of preventing allergies in children. They also discuss the role of food allergies and allergens and review the common myths surrounding them. The most effective treatments, both drug-based and homeopathic, are analyzed and weighed against one another. Helpful Appendices offer a summary of the causes, symptoms, and possible treatments for hay fever as well as various sources for further information. Allergy is generally misunderstood. Left untreated it can lead to serious degenerative disease. Asthma, migraines, arthritis, ulcers and obesity have all been linked to allergy. Fatigue, irritability, body aching, digestive problems, and other vague ailments are typical of allergy. Dr. Bateson-Koch provides insight into why allergy is becoming more common, how it relates to environmental factors, food additives, diet, digestion, body chemistry, addiction, yeast, molds, parasites and childhood illnesses - and why enzymes are the key to healing. by Peter Schleicher, Mohamed Saleh, Schleicher Peter M.D. The first book to fully explore the extraordinary effectiveness of black cumin against immune-system disorders, allergies, asthma, and skin problems. 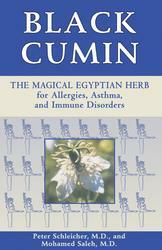 • Written by the world's foremost experts on black cumin. • Includes precise directions for preparation and specific recipes for treating a variety of ailments. Because of its complex chemical structure—it has over one hundred active ingredients—black cumin has positive effects on the respiratory, immune, circulatory, digestive, and urinary systems. It is enormously effective against asthma, stomach ailments, and numerous skin conditions, ranging from acne to psoriasis. It also has been the subject of intensive scientific research indicating that it strengthens and stabilizes the immune system and is greatly beneficial in the treatment of allergies.